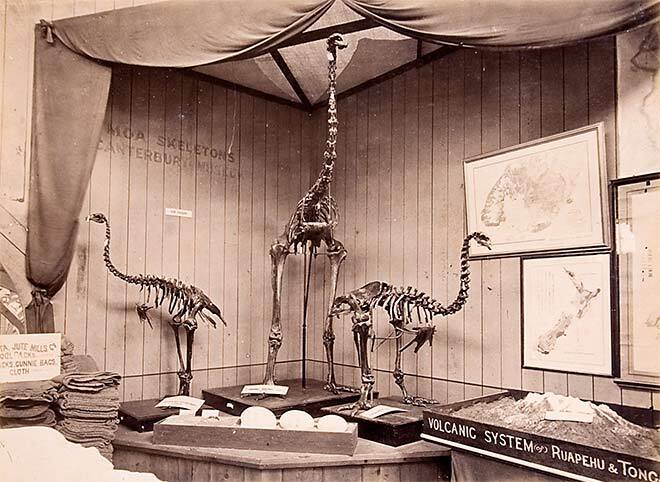 These moa skeletons were provided for the 1879 Sydney exhibition by Julius Haast, the director of Canterbury Museum, and came from the major excavations at Glenmark in North Canterbury. Alongside the moa can be seen geological maps and a display of the volcanoes of the central North Island. The birds and geology of the country were always an important element in New Zealand's displays at 19th-century international exhibitions.